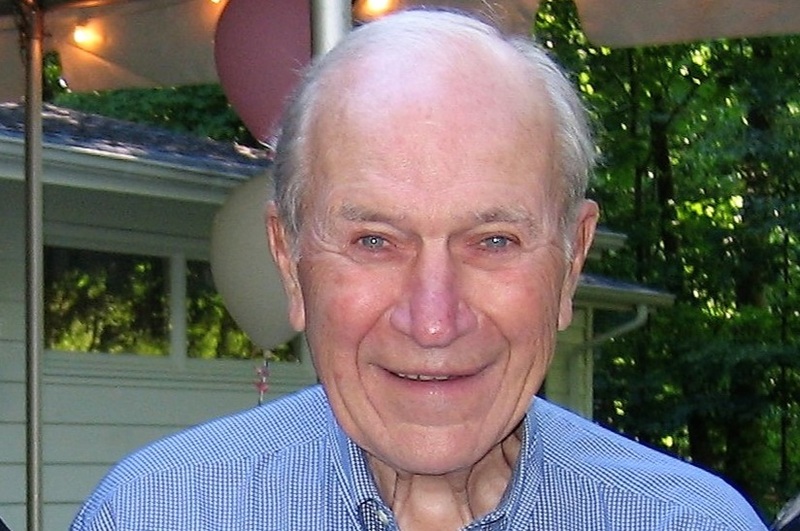 John A. Favret, age 92 of Chagrin Falls, passed away on Saturday, February 2, 2019. He was the beloved husband for 69 years to the late Jane E. (nee Bohmer). Born on December 17, 1926 and raised in Cincinnati, he was the third of seven children, son of James R. and Helen (Gilligan). Jack entered the United States Navy in 1944 before he turned 18, and served as a radar man on the aircraft carrier U.S.S. Cabot and others in the Pacific area until his 1946 discharge. He graduated from the University of Notre Dame in 1949 with a Bachelor of Science degree and joined the accounting staff of the firm his father has founded, Rouse, Favret & Company. He became a certified public accountant in 1954 and joined the international public accounting firm of Haskins & Sells when it merged in 1955. He was transferred to Cleveland and became a partner in Deloitte Haskins & Sells in 1966, then retired from the firm in 1989. Jack was an active member of St. Dominic Church since 1961, having served as a member and President of the Parish Council and one of the founding members and President of the Bulldog Club. He was an assistant coach of the school football team and served for ten years as a teacher of religion to high school boys. Mr. Favret was also active in community affairs, as a trustee of Buckeye Boys State and Director of The Marotta Montessori School in the inner city of Cleveland. He was a trustee and past president of the PATH Association, a community organization interested in improving housing for the low and moderate income families in the inner city. Jack was a member of the Distribution Committee on the Bruening Foundation and was a Director of the City Club Forum Foundation, Director of the Free Clinic in Cleveland, Director of the Gorman Lavelle Corp. and Seigferth, Inc. He also belonged to the Citizens League, and the Council on World Affairs. Jack loved the adventure in travelling the world with his wife. Together they toured the USSR, China, Hong Kong, South America, Canadian Rockies, Africa and all over Europe. They renewed their vows on their 60th wedding anniversary on shores of the Sea of Galilee. He enjoyed playing golf and was a member of the Shaker Heights Country Club. He also enjoyed sailing his Ensign sailboat in the Les Cheneaux Islands, where he had a summer home, and belonged to the Les Cheneaux Yacht Club. Jack and his wife, Jane were the parents of seven children, of whom he lovingly referred to as “The Lucky Seven”. They are Thomas P. (Melissa) of Chagrin Falls, Susan F, Samerdyke, (Paul) of LaBelle, FL, Jack Jr. (Barbara) of Cleveland Heights, Sarah M. Steiner (John) of Bainbridge Island, WA, Julie F. Smith (Jack) of Somerset, MA, Paul G. Favret of South Euclid and Timothy J. of Shaker Heights, OH. His children feel truly blessed and especially loved. Jack and Jane were also the proud grandparents of twelve and the great grandparents of eleven. Dear brother of Andrew Favret, William Favret, Jeanne Dell (Daniel) and Richard Favret (Gayle). His family will always remember him “When Irish Eyes are Smiling”. The family prefers that those who wish may make contributions in his name to The Church of St Dominic's School, c/o The Church of St Dominic, 19000 Van Aken Blvd., (at Norwood Rd.) Shaker Hts., OH 44122, where a Funeral Mass will be held Friday, February 22nd at 11am and WHERE FRIENDS MAY CALL ONE HOUR PRIOR TO THE SERVICE. Interment, All Souls.